Sometimes you need to access server behind firewall or proxy that do not have VPN facility or this facility is to beuracratized to use. In this case creation of reverse tunnel can help. Port 443 (HTTPS) is usually open. The "-n" option tells ssh to associate standard input with /dev/null, "-N" tells ssh to just set up the tunnel and not to prepare a command stream, and "-T" tells ssh not to allocate a pseudo-tty on the remote system. These options are useful because all that is desired is the tunnel and no actual commands will be sent through the tunnel, unlike a normal SSH login session. The "-R" option tells ssh to set up the tunnel as a reverse tunnel. Login as support engennere. You will get regular session with this remote host. You have to give a shell access on outside_server_name to a foreign user (JoeUser) in order to let him connect to destination. But take care this last command makes the destination UNIX system being exposed to Internet via outside_server_name. IP filtering and/or a knockd daemon are recommended on outside_server_name if you do not want an internal server being scanned. first of all, thanks for this great tutorial. I ran into some trouble first, and I got this "Address family not supported by protocol" when I tried to use the reverse tunnel to go from HOME back into the LABNODE, which is behind the firewall. It's because the LABNODE didn't know about 'localhost'. I changed it to 127.0.0.1 and now it works. Here's my setup for user 'labuser' on the LABNODE from which I open the initial (reverse) tunnel to my HOME node. I'm using a config file which lives in $HOME/.ssh/config - this file is only readable/writeable by the owner itself ( chmod 600 $HOME/.ssh/config ). This is how the file looks - 'babylon' is the username on my HOME computer. After entering the password, I am back on my LABNODE. If you get bored of always typing your password, you can generate ssh-keys on LABNODE and HOME. Then you copy the content of the public key files id_rsa.pub into the authorized_keys files on the other host. Do NOT copy your private key id_rsa file. Now run this for the other host as well and you're set ! Reverse tunneling is very, very useful but only in quite specific cases. Those cases are usual the result of extreme malice and or incompetence of network staff. The only difficult part here is to determine what's the most common attribute of most IT/networking departments: Malice or incompetence. My last IT people had certainly both. Not if you build appliance products which you sell to others which, when you need to support them, will generally be running behind NAT. You need the appliance to, when the customer clicks the button when asked to by support, create a reverse tunnel that allows support to connect in without the customer having to port forward through their firewall reducing their security. Same for companies moving equipment between buildings that have no on-site IT staff: Rather than punch holes through a firewall to allow anyone to connect and play, it might be more secure to make equipment tunnel back to HQ and remain connected instead of sitting there ready for anyone to connect. At least in this instance, you don't have an open port in your firewall, and the box with reverse tunnel configured won't accept connections from anyone but the host it's reversing for. This said, there are myriad other ways of achieving security even if you do punch holes in the firewall, eg. Port Knocking, but if you do punch holes through the firewall if it's not properly configured your open ports will be visible to anyone who knows how to use nmap. Nothing to do on the iPhone. Most jailbreaks include OpenSSH or you can download (Cydia) OpenSSH onto your iPhone. I've changed my iPhone root password, but if you have not, the default password is Alpine (change it right away after your first SSH into your phone). Now on the MacbookPro17 laptop I just use localhost and port 9999 as the SOCKS proxy and a simple browse in iPhone Safari or checking of Mail will flip the iPhone into accessing the internet which is now wide open for use by the MacbookPro17 laptop to use. SSH, freeing the masses everywhere! Make sure you are not in violation of a company security policy when doing this. At the company I work for you can be fired for violating the security policy and I know that is true elsewhere. you'll be able to maintain your reverse tunnel connection. - LocalForward - enabling reverse local foward to local system from a system that is behind a firewall we are making connection to. I use this program for a remote printing setup. I do a config for about 12 localhost ports that cups prints to and they goto the corresponding ip addresses at the branch office. I have multiple configs for each of our branches and its really a cheap way to do remote from server printing with out costly VPN hardware and problems. of course there has to be a proper setup on the destination to accept the pubkey auth. Autossh keep the connection up, if it can connect and login the tunnel is UP, never down, except when there is a real traffic problem on the internet. Some of our tunnels are between continents, the simplicity of autossh is what makes its so great! It could just as easily be used for reverse tunnels. And can be configured to run from an init process, so its even possible to do more stuff. Another option that would end up being more scalable would be to just setup a VPN service on your NAT router at home. If your router can run the dd-wrt firmware, this is pretty easy to setup. Otherwise you could run the VPN service on your linux box, and just forward the ports. "sudo ssh 138.47.99.99 sudo /usr/sbin/pppd notty 192.168.254.254:192.168.254.253"
which provides a ppp0 interface on each of the two machines. "remote port forwarding failed for listen port"
where you know the root password and enter the password when prompted. Obviously root can be changed to some other username too as long as you know that username's password. I don't get what is supposed to be reverse about this normal plain ssh tunnel. The name is misleading in my eyes, it is just a vanilla ssh tunnel, port forwarding. 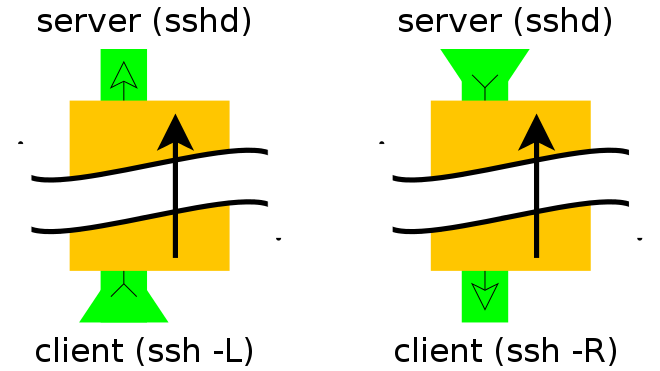 This is 'reverse' because most ssh tunneling opens a port on the local machine an forwards connections from that port on the originating machine to somewhere on the other end of the connection. The 'reverse' connection here opens port(s) on the remote machine, and forwards it to a port on the local machine. The direction of the connections has been reversed. 3rd party servers can also access 192.168.20.55 through Destination Source (138.47.99.99). what if both source and destination are behind NAT? Then you'd have to use another computer/server as an intermediary(aka:middleman). Using the same port on the local and remote machine reduces the value of the example. The learner will have to use additional resources to figure out which of ####: or :#### represents the local and remote compu's. For the record ####: is the listening address (on the remote server during a reverse forward) and :#### is the destination address, on the local machine. Let's say it is required to connect to an internal university website from home. The university firewall is blocking all incoming traffic. How can we connect from 'home' to internal network so that we can browse the internal site? A VPN setup is a good candidate here. However for this example let's assume we don't have this facility. Enter SSH reverse tunneling..
by visiting http://localhost:9001 in 'home' web browser. The 'work' will then create a connection to intra-site and relay back the response to 'home' via the created SSH channel. As nice all of these would be still you need to create another tunnel if you need to connect to another site in both cases. Wouldn't it be nice if it is possible to proxy traffic to any site using the SSH channel created? That's what dynamic port forwarding is all about.